Are The Odds Improving For Thoroughbreds? In spite of a long, focused effort to legalize pari-mutuel betting, horse racing still hasn’t made it to the starting gate in Georgia. 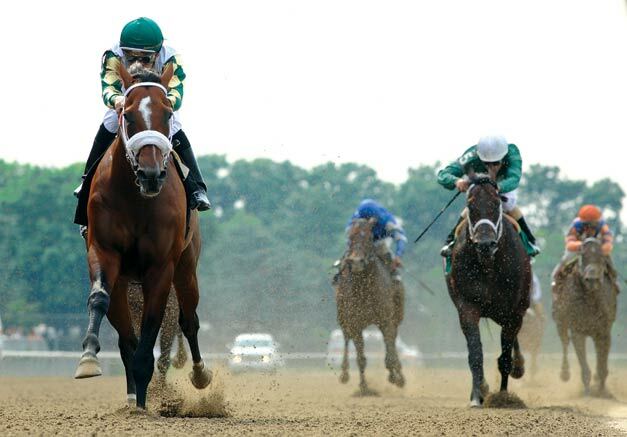 On A Roll: Mucho Macho Man|! !| left|! !| owned by Georgians Dean and Patti Reeves|! !| won the Suburban Handicap at Belmont in July and came in third at the 2011 Kentucky Derby. This is when you know you’ve made a good investment in thoroughbred horse racing: The green two-year-old you recently purchased for $14,000 wins his first race at 35-to-1 odds. Then, a month later he wins at 25-to-1. And a month after that, he makes it three-for-three, winning at 20-to-1. “Yeah, I was pretty well hooked by the second race,” says Poston. Months earlier, he and a couple of friends went to Ocala, Fla., intent on buying a horse. They pitched in to buy You So Bad, who proceeded to win all three of those races, against those tremendous odds, at Miami’s Calder Race Course. Now Poston is wondering when and if Georgia’s political leadership will ever get “bit by the bug,” because so far, in spite of a determined effort from proponents of the sport, thoroughbred racing hasn’t yet made it to the starting gate in this state. “It’s going to happen, it’s just a matter of when,” says Roswell attorney Ed Gadrix, president and executive director of the Georgia Equine Education Project (GEEP), who has joined State Rep. Harry Geisinger in leading the effort to bring thoroughbred racing to Georgia by legalizing pari-mutuel betting on the sport. Because let’s face it, you can’t have one without the other. Thoroughbred racing with wagering would be “a big benefit to the state, a real revenue producer,” according to Dean Reeves of Suwanee, CEO of Reeves Contracting but better known in racing circles as majority owner (with his wife Patti) of Mucho Macho Man, third-place finisher in the 2011 Kentucky Derby. Geisinger believes Georgia should go after whatever shekels thoroughbred racing can raise, and he expects it’s quite a lot, enough to make it worth his time. Last year, he led the House Study Committee on the Horse Racing Industry – the second time he’s chaired such a group (the first time was 2009-2010). Geisinger’s goal has been to gather enough information to support two pieces of legislation: a proposed constitutional amendment that would appear on the next statewide ballot (they were aiming for this November), and a second piece, the enabling legislation that specifies how thoroughbred racing would work (there would be a Georgia Racing Commission). In February, a poll conducted by Landmark Communica-tions for the Georgia Horseracing Coalition, a group led by At-lanta developer Hal Barry, showed that 72 percent of Geor-gians supported bringing pari-mutuel betting and horse racing to the November ballot. But the proposed legislation never had a chance to win this year. It didn’t even place or show. So, it never reached the House floor, and a senate proposal to legalize gambling on thoroughbreds finished out of the money as well. But the horseracing crowd isn’t discouraged. “Our chances get better with every session,” says Geisinger, who has owned horses in the past and plans to take up the legislative cause again for the next session, with an eye on the 2014 statewide elections. Barry, chairman of the Atlanta Steeplechase, likes the odds. These men are not only optimistic that thoroughbred racing is in Georgia’s future – they believe it’s reasonable to expect that Atlanta could become a permanent home for one of the sport’s most prestigious events, the Breeders’ Cup. Geisinger’s committee spent time rubbing elbows with some of the big wheels in horse racing, visiting thoroughbred country in Kentucky – on their own dime, not the taxpayers, says Geisinger, who also hosted Bill Farish, former Breeders’ Cup chairman, and Nick Nicholson, president and CEO of Keeneland Association. The Breeders’ Cup offers one of the richest purses in the world, and Keene-land in Lexington, Ky., is a Shangri-La of thoroughbred racing in Kentucky – one of the top-ranked racetracks in North America and a national landmark (most of Seabiscuit was shot there), world renowned for its quarterly horse auctions and massive research collection. Geisinger and his cohorts brought these guys to meet with Gov. Nathan Deal with the purpose of touting the economic benefits of thoroughbred racing, but the governor didn’t seem overly impressed and claims to be no fan of gambling. And still, the horseracing crowd seems unperturbed, filled with ideas and what-ifs. “I’m not saying we’d get the Breeders’ Cup, but you know,” Gadrix says, “it moves around to different locations each year, and if we had thoroughbred racing, we would certainly get one. Louisville, home of Churchill Downs (which is the home of the Kentucky Derby), isn’t that kind of city, he adds. And it was Farish, who still serves on the board of the Breeders’ Cup, and runs one of the premier thoroughbred farms in the world – in the heart of Kentucky – who suggested Georgia’s potential for attracting major stakes races. “It’s because we have the good weather in early November, which is always the week of the Breeders’ Cup,” Geisinger says. “We have the airport, with all those big jets for the horses and people from around the world. We have the great restaurants and hotels. Even though Deal wasn’t exactly swinging at his visitors’ pitch, Geisinger says he feels confident about thoroughbred racing’s chances under this governor, something he never felt when Sonny Perdue was in office. There is the house resolution (HR 186), which proposes a constitutional amendment legalizing gambling on horses. The final say would be up to Georgia voters, but first it would need approval from two-thirds of the membership of both chambers – and it can’t be vetoed by the governor. Then there is the enabling legislation. It was called House Bill 1305 this year, HB 467 during the 2011 session, basically the same things, calling for the establishment of a Georgia Racing Commission, legalizing betting at the track and (perhaps more important) at off-track, satellite locations around the state. The state would get its cut and, like the lottery was intended to do, support education initiatives (college tuition grants, pre-k), but also fund a trauma care network. “And unlike other professional sports, taxpayers won’t be asked to pay for a stadium – the racetrack, or tracks, would be built by a private individual or corporation, with the racing commission’s approval, based on the merits of the project,” Geisinger says. Geisinger has a slip of paper with some big numbers on it, but he wants it back and he can’t say who it’s from. “This is somebody that’s prominent in the community, somebody in town,” Geisinger says. It’s a plan for one track with 20 satellite facilities – OTBs (for Off-Track Betting). These would be restaurants, lounges, sports bars essentially, with betting. And while the racetrack can be somewhere in Metro Atlanta, maybe north of town, these OTBs would be places like Dublin and Hawkinsville. And the existence of each one, Geisinger says, would depend on the votes of local citizens. By the third year of operation, according to this anonymous plan, the whole enterprise would be generating an economic impact of about $450 million. “But I kept telling him that he wants to build the track in the wrong place. He believes that now, and he’s looking elsewhere,” Geisinger says. It’ll take at least 200 acres, and it shouldn’t be too far from Atlanta and the airport – the Atlanta Steeplechase moved to a beautiful spot between Cartersville and Rome, but it’s too far out of the way, according to some who are involved with that event, and attendance has fallen off, though it remains the state’s premier racing event – thoroughbreds jumping over fences on a turf track. “The training is more the same than it is different, but it takes a different type of thoroughbred horse to run over fences,” says the Atlanta Steeplechase’s Barry, burned in the real estate meltdown and hot for pari-mutuel betting on horses. “It’s a no brainer, really. It’s an entire new industry for the state,” he says, adding that proximity to Atlanta is critical. The senate’s proposed resolution singled out Conyers and the Georgia International Horse Park. But the interest might be north of Atlanta. Keeneland Race Course is basically open several weeks at a time, twice a year, when they hold big-time prep races for the Kentucky Derby in the spring and the Breeders’ Cup in the fall. But Keeneland also holds simulcast events, where the sporting crowd can place wagers on races happening miles away – like the Derby at Churchill Downs, or the Belmont Stakes in New York, and so forth. It’s a different kind of OTB – it’s OTB at the track, a different track, and a number of tracks are doing it. Geisinger was particularly interested in what Colonial Downs is doing in Virginia. Colonial Downs does the simulcast thing, but they also own a number of OTB centers scattered around the state, where you can bet on simulcast horse racing year round on tracks across the country. Sit down for a beer and a burger in downtown Richmond and place a few bucks on the third race at Golden Gate Fields. “I found one just outside of Kingston, Tennessee, literally a hundred feet across the border in Virginia, an auto dealership converted to a satellite wagering facility,” Geisinger says. “Tennessee does not have wagering, but two thirds of the cars in that parking lot were from Tennessee. Jobs in rural areas, for farmers growing feed, for vets and other animal healthcare professionals, for trainers and everyone involved with getting a horse around the track as fast and healthy as possible. That’s what Dean Reeves believes. After years of running Atlanta-based Reeves Contract-ing, the company his father started in 1952, he was in a financial position to answer such a question. In 2007, while he and his wife, Patti, were vacationing in the Turks and Caicos Islands, they met Bob and Esther Ades, racing folk who already had one starter in the Kentucky Derby. They discussed the question that had long lived in Reeves’ mind, formed a partnership – Ades & Reeves – and went to Keeneland to buy a horse. They spent $100,000 for a horse named Fearless, who raced a few years, injured his tendon, and got sold to a guy in Illinois who is breeding him. Ades & Reeves bought two more horses in 2008, a gray colt called Cause I Can, and a chestnut filly called Giant Success. Cause I Can is still racing at five years old, having earned a respectable $155,829 in 23 career starts. Dean and Patti formed Reeves Thoroughbred Racing in 2009 and have added several more horses to their stable, but their unquestionable star is Mucho Macho Man, who has earned about $1.5 million in 16 starts, including six firsts, three seconds and four thirds – he’s finished in the money 13 out of 16 times. Reeves decided to buy the horse in July 2010 after watching him race online. After Ritvo left to become president of Gulfstream Park, his wife, Kathy Ritvo, became Mucho Macho Man’s trainer. Together they made Tim look like a prophet as the Man became a top 20 earner, qualifying for the 2011 Kentucky Derby, where he took third place as that year’s Cinderella story. A four-year-old, he has emerged as the top older horse of 2012, winning three out of four of his first starts, including the Suburban Handicap at Belmont Park last month, and seems headed toward the Breeder’s Cup. In May, Reeves Thoroughbred Racing bought the remaining interest in Mucho Macho Man from their investment partners, Dream Team Racing Stable. The Reeves have nine horses now, including one of the best in the country. They’re having a great run, all of it outside Georgia’s borders. Their horses are kept and trained in Florida and New York. Reeves would prefer being closer to his investments.